this post was originally published in 2014. the photos were definitely dated, and needed some refreshing. plus, the chewiness of butter mochi and custard mochi is very similar to that of nian gao, a chewy chinese mochi dessert that’s served during the lunar new year (which passed 2 days ago). i’m keeping the original post, because i’m a sentimental person. much of my time at aunty lily’s was spent trying not to step on hyper dogs, hunting for easter eggs and watching my aunts and uncles scream in laughter after seeing the newest, most outrageous entry into the annual white elephant game. despite how busy i ended up being, i always found time to accept a piece of butter mochi from aunty lily. aunty lily was technically my great aunt, but unofficially the grandma i never had. don’t get me wrong. my paternal grandma is always lovely. she smiles so brightly when i see her, and she would always make me my favorite spareribs when i was little. she also brags about me incessantly (which is pretty nice). the language barrier is a bit of an obstacle (she speaks cantonese, i speak english, a minuscule amount of french and dim sum), but we still enjoy each other’s company. i never met my mom’s mother, unfortunately, but my step-grandma is always quick to give me loquats, dried apricots, and compliments on my desserts (even when i made cream puffs that never puffed). she speaks more english than my paternal grandma, but it’s still hard for us to communicate. aunty lily, on the other hand, spoke english. she’d take my boy cousins to the arcade, and me and my girl cousins out to lunch. she was always travelling and ready to take on a new adventure. and she always had a pan of butter mochi lying around. it’s best on the day it’s made, but even i couldn’t turn away a warmed up (just enough to soften) day-old piece. her cancer diagnosis was a huge blow to the family. she was the glue that kept us together and happy, and we all loved her immensely. she didn’t slow down until the last week, and passed away peacefully in her sleep. i’ll always miss her. having butter mochi makes me feel like i’m with her again. when i get lonely, i drive to the nearby asian market and buy a box of mochiko. an hour later, i’m greeted by the warm, luscious scent of butter melting and mingling in all the best ways. it’s like she’s giving me a hug. notice the milk? the original recipe aunty lily gave me didn’t have the milk. so, on one of the days when i was craving butter mochi, i made it. i was so anxious when it came out of the oven. i could feel the taut chewiness between my teeth, the crispy then soft texture on my tongue. i tried to cut into it. my knife never made it past the top layer. the mochi was hard as a rock, and seemed to grow impossibly more unyielding as time passed. aunty lily later laughed as i relayed the story to her, and lovingly added a note that reads “+ 3 cups milk (:” on my copy of the recipe. and if you don’t know what mochiko is, it’s a sweet rice flour, so it’s gluten-free. it’s what gives the mochi its characteristic elasticity and chew. butter mochi is, unfortunately, one of those things that doesn’t taste good hot, or even warm. one’s patience can get sorely tested while waiting for a batch to cool (which takes a while; many a time, i’ve had to hold the pan in a sturdy, thick cardboard box while transporting it to a party because the mochi was still hot). but once it’s ready to be consumed, nothing can stop me from cutting a huge rectangle and chowing down. now, why did i make a batch today? for one of the members in my group for a physics project. you see, i brought over cream cheese brownies the other day for my group to enjoy. except i didn’t know that she was gluten-free. i know it wasn’t my fault, but i still felt bad, and vowed to make her mochi. i eventually did during one of our meetings, because i’d rather bake than engineer an upside down loop out of duct tape and foam tubing. i almost forgot the milk, but thankfully remembered to stir it in at the last moment. i’ve also included a recipe for custard mochi. it has more milk, and the resulting mochi is creamier. it tends to separate into two layers: a creamy, buttery, unctuous top with a more modest, chewy bottom. some people may not like it, but i think it’s pretty superb. also: when i say 1 package of mochiko, i’m talking about the koda farms mochiko. one package is the perfect amount for these recipes, and you don’t need to measure out the mochiko. that being said, you can definitely use another brand of mochiko, so long as you use 1 lb of it when you make these mochis. 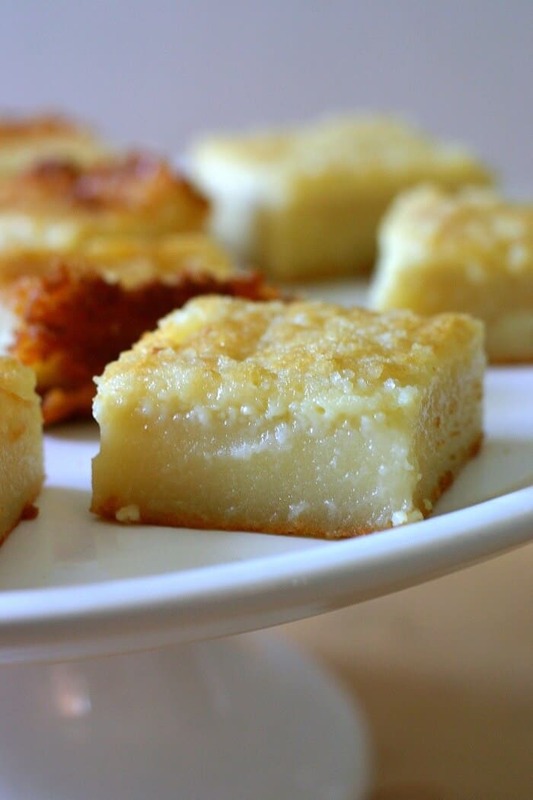 Butter mochi is a chewy, buttery Hawaiian dessert made of sweet rice flour. Mix all ingredients together. Pour into a 11x15" dish. Bake at 350F for 1 hour; the top will bubbly, golden brown and poofy. Cool completely (it will deflate) before slicing (it's easiest with a plastic knife so that the mochi doesn't stick to the knife) and serving. You can store leftovers at room temperature for a few days or in the fridge. If you refrigerate it, however, the mochi gets a little hard and I like it best reheated (I prefer toasting or microwaving). From Aunty Lily (there are a bunch of very similar ones that you can Google as well; not sure where Aunty originally got the recipe from). During my most recent batches, the butter (which rises to the surface of the mochi during baking) has bubbled over a bit in a 9x13" pan, so I suggest either using an 11x15" pan or using a 9x13" pan with a baking sheet on the rack below the pan to catch any drips. Another thing to keep in mind: an 11x15" pan yields mochi with a higher crispy crunchy top to chewy mochi ratio, whereas a 9x13" pan yields mochi with a thicker middle and less of the topping. Your choice, but I love more top (chances are, if you're into muffin tops, you'd like the thinner, crispier mochi, too). 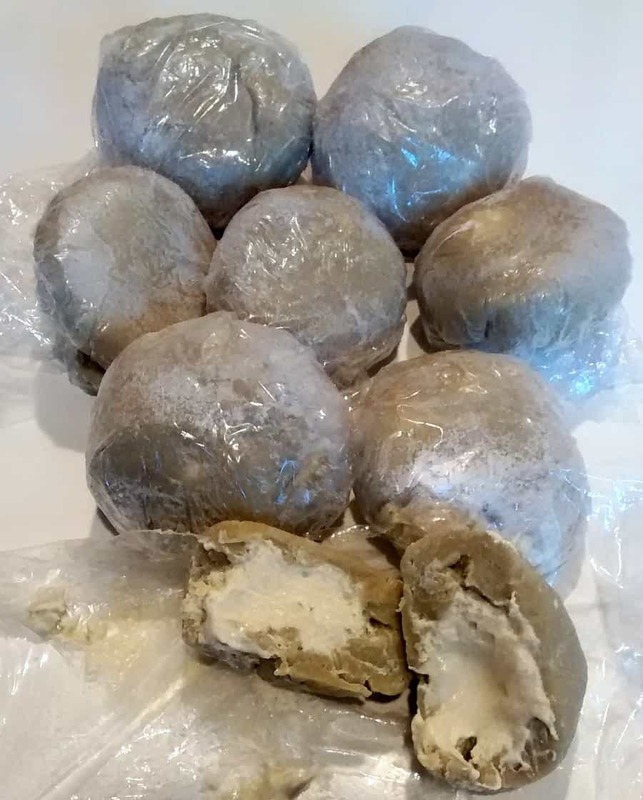 Custard mochi is a slightly creamier, lighter version of butter mochi. 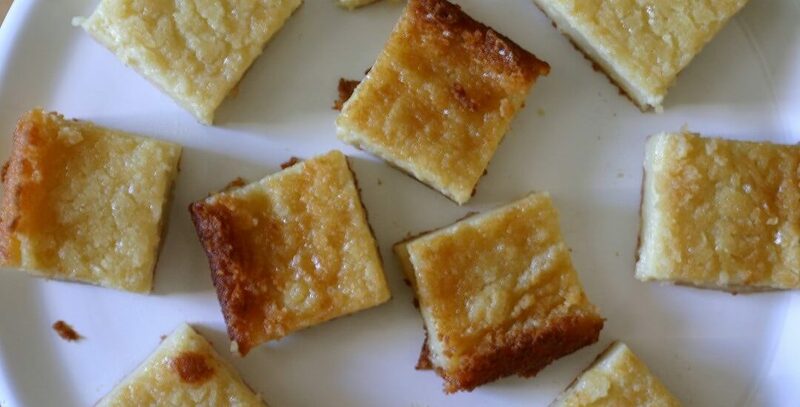 Both versions of the popular Hawaiian dessert are made with sweet rice flour, which gives them that chewy texture. Cream the butter and sugar. Add eggs one at a time, beating well after each addition. Add the rest of ingredients and mix until well blended. Pour into a 11x15" pan and bake at 350F for 80 minutes, or until center is firm and the mochi is golden brown on the edges. Cool completely (it will deflate) before slicing (it's easiest with a plastic knife so that the mochi doesn't stick to the knife) and serving. yay so glad you love it hop :3 also, if you haven’t tried butter mochi, you need to get on it (super easy, and i’m betting you like japanese mochi anyways). Is your custard mochi recipe the one where the custard ends up on the top of the mochi? 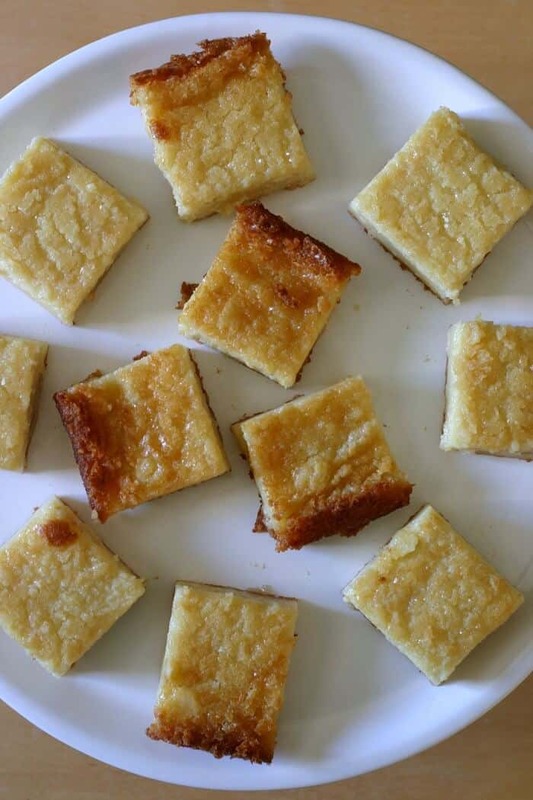 If not, do you have a custard butter mochi recipe? I made it once by accident and stupid me did not write down what I did and now that I want to make it again, I can’t find a recipe. I have never had this before, and I am so intrigued that I must make it! I love chewy cakes especially toasty ones but sadly I am terrible with sweets so I usually need to buy them, but now I want to actually make this! oh you speak too?! normally people speak chinese but not solely dim sum. we’re a minority 😉 awh thanks! i’m glad this post was so cozy and comforting 💖 this one is super chewy and similar to the texture of the inside of jian dui/ham sui gok. this one is really easy and basically foolproof. just don’t forget the milk! oops i might have explained that badly. the chewy white middle part has the texture of jian dui and ham sui gok, but it’s not quite as crispy (this is baked and those dim sum treats are fried!). Ya I know what you mean 🙂 I love the chewy part. I’ve never tried a custard mochi before, but it seems delicious! Cannot wait to try it! it’s so good! it’s very chewy and bouncy (if you haven’t had mochi before, it’s unlike anything else i’ve had and i have such a hard time describing it). Do you think using 2% milk would have an effect on the final product? I’m looking specifically at the custard mochi. Thanks! I’m in Canada where we have homogenized milk, which is 3.75%. It’s delicious but I don’t like having it around – a little too delicious, if you get me. haha (; you’ll have to try using the 3.75% when you can bring the mochi to a potluck or something! These look so creamy and satisfying! I love the idea of Mochi – I’ve never even attempted, but I need a reason to go to Uwajimaya – so given the idea to buy mochiko, I may just make it there! Your photos are lovely, I feel like I can taste the Mochi. thanks for the recipe – Pinning for later! haha i never need a reason to go to uwajimaya (or any new grocery store for that matter!). It is so heartwarming that you have such fond memories of your aunty. I’m sure she is watching over you. I love custardy desserts. This butter mochi looks so good and just my kind of thing! It reminds me of my favorite Portuguese dessert called queijadas which are a kind of custard cupcake. Butter Mochi??? Yes Yes Yes Please. I would have a terrible time waiting for this Butter Mochi to cool off. I just might try these soon, my mouth is watering. Love your story very much ! Thank you for sharing ! That is such a special memory! And in answer to your question about the Matcha, no, I cannot get it shipped here. We can buy it locally but it is very expensive as it is imported. I try and not buy imported products which is why I would have to find some when overseas. maybe a trip to japan is in store? (; finding some matcha can be a nice excuse! As I love creamier treats, my pick is the custard mochi, Heather! Perfect combo of ingredients which will bring the Hawaiian taste closer! I completely understand. I’ve deleted a few dozen blog posts from 2013, just to be able to re-do the photos! These look really lovely! I’ve never heard of them!!! These look so good, I can just imagine the texture of them! These look so soft and yummy. I’ve never tried Hawaiian sweets before. I have never tried anything like this!! They look super addictive – anything buttery like that and I can’t stop! What lovely memories you have of your Aunty Lily! 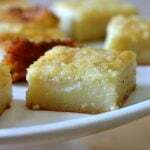 This butter mochi looks so yummy. When my husband and I were in Hawaii, we made a stop at Two Ladies Kitchen and got a big box of mochi… now I crave it. I may need to attempt this recipe. oooh i remember going to two ladies! 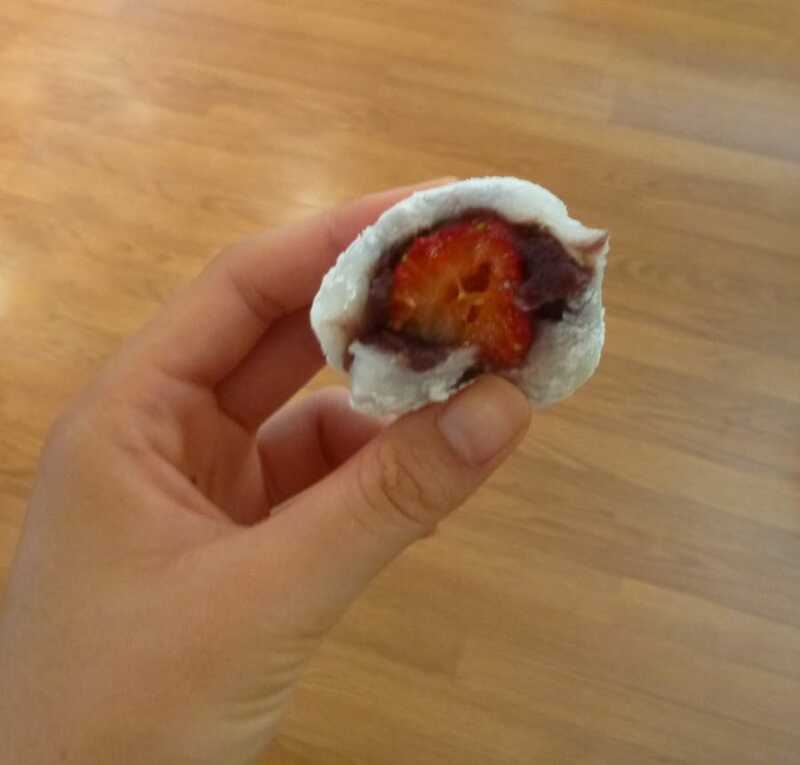 i remember how good their strawberry + red bean mochi was (it’s so hard to make at home though- i think it’s a superpower to be able to thinly wrap mochi around a whole berry!). Dude, this is why I love reading your blog, I’m always turned onto new things! 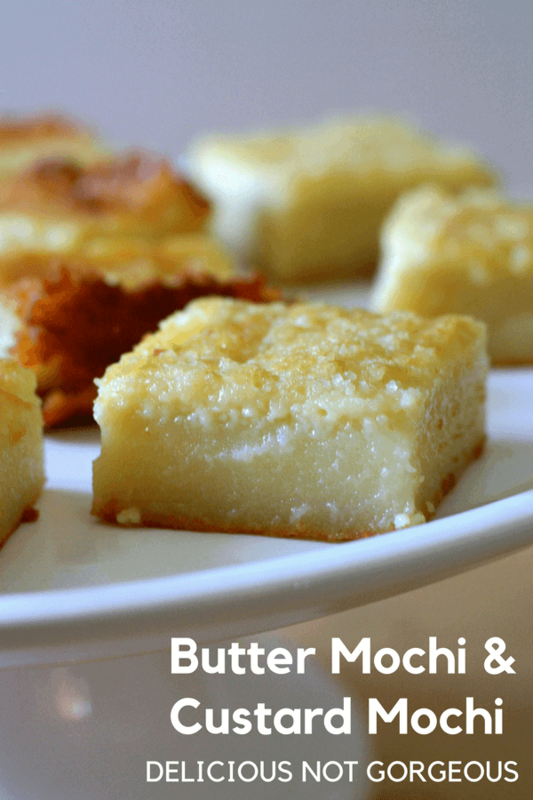 I haven’t heard of butter mochi custard mochi until now, and I can’t wait to try it! They look simply amazing! Haha, classic parents/grandparents bragging. LOL Dim sum is life! My boyfriend is starting to speak dim sum with bolo bao. It’s great that you shared some good memories together. I’m sorry about her passing. Wishing your family the best. The mochis look delicious! Definitely something I’d want to try out to feed my curiosity. you’ll have to get him on the gong chau ngau ho and hom suey gok train as well (; (also, do you have any dim sum recs in the oc? the chinese food seems kind of sparse around here lol). Aunt Lily sounds so warm and loving:) Glad you have her recipe to remind you all of the fond memories. We love mochi anything, the chewy texture is so addictive. This custard looks easy and creamy. Hope you have a great weekend heather. I love all the memories we associate with food, especially the time spent with loved ones. Sounds like you have some great memories of your aunt. Thanks for sharing Heather! This sounds like a delicious recipe. same! i love hearing about food traditions (especially around special occasions – i feel like everyone has thanksgiving/birthday/new years food memories!). Wow this is definitely something I need to investigate, it looks so tempting!